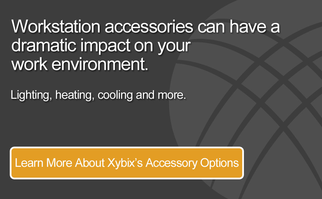 The type of workstation lighting you choose can have a dramatic impact on your work environment as well as the overall costs associated with maintaining your workstation into the future. There are a variety of lighting elements to consider when you are looking at updating or replacing your lighting. To begin, we need to briefly discuss the most widely used types of lighting available in today's market. Incandescent Light Bulbs are the original and time tested light bulb. Patented by Thomas Edison, this light bulb has been widely used since the late 1800's. A variety of sizes and shapes are available for almost any lighting requirement. However, the initial cost of an incandescent bulb is small compared to the energy it uses over its lifetime. 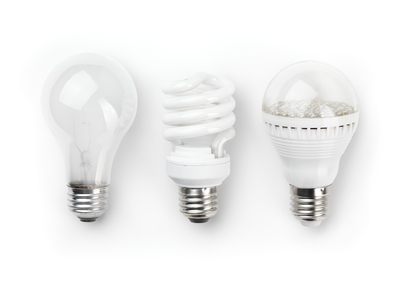 Recently, the US federal law has scheduled these bulbs to be phased out by 2014. Compact Fluorescent Light Bulbs (CFL's) were designed to replace the incandescent bulb. This light converts electrical energy more efficiently than its predecessor and last between 8 to 15 times longer and uses two-thirds to three-quarters less energy. The fluorescent light bulb does bulbs contain mercury and have special safe disposal and recycling requirements. Light Emitting Diodes (LED's) have been around since the 1960’s, but in the last decade these lights have become increasing more popular in many modern day applications. This surge can be attributed to the many of the different positive features LED’s have to offer such as energy efficiency, environmental impacts and overall light output. It has been said that the lifespan and electrical efficiency of the LED light is significantly better than most other lighting sources. With that being said, for the purpose of this blog, we will be discussing the various features and attributes of LED lighting and LED task lights. It is my recommendation that LED lighting be used as the primary lighting source for your workstation. The following five discussion points can be used to make a case for the use of LED lighting at your workstation. When comparing the annual energy usage of different light sources it is clear that LED’s are by far the most economically viable solution. Although the initial upfront cost is a bit more expensive, you can be sure when comparing LED’s to incandescent light bulbs and compact fluorescent light bulbs(CFL’s) that they will last longer and use far less energy to create the same amount of light. Today, we are all looking for ways to reduce the introduction of harmful materials and chemicals into our environment. Whereas CFL’s can typically run for 8,000 hours and incandescent bulbs last 1,200 hours, LED’s can last up to 50,000 hours. Given the lengthy product life of LED's, choosing this type of lighting will help reduce your contributions to the landfills, thus diminishing your environmental impact. Another positive feature that LED’s have over its competition is the light output per watts. Currently, LEDs can produce around 1,100 lumens (the approx. amount of light a high powered flashlight can produce) with only 9-13watts of energy, with CFL’s using 18-25watts and Incandescent Bulbs using 75watts. This shows that it takes much more energy for traditional bulbs to produce the same amount of light as LED’s. LED’s have many other benefits that are not common knowledge such as their ability to work in extreme heat and cold as well as humid environments where CFL’s may not function correctly. The increased durability of LED’s compared to traditional bulbs allow them to be used in more physical operations where movement and occasional bumping can occur. With the increase in LED technology combined with the reduction in cost, any workstation you might be considering for 911 dispatch, security/surveillance, government operations and more should be lit using 100% LED light. Be sure to look for workstations, that use LED's for status indicator lights, overhead and desk task lighting, under work surface lighting and ambient bias lighting.